The development of the Think of Us application was done in two phases: web followed by mobile. These two vantage points for users’ information shares the same database and would (hopefully) have the same functionality. 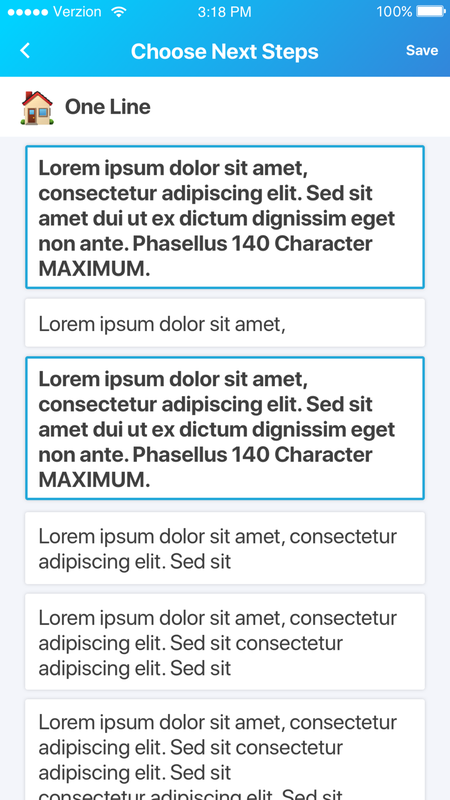 As the sole designer for the first three months of the mobile development, I worked very closely with both our CTO and CEO to create the interface designs below. 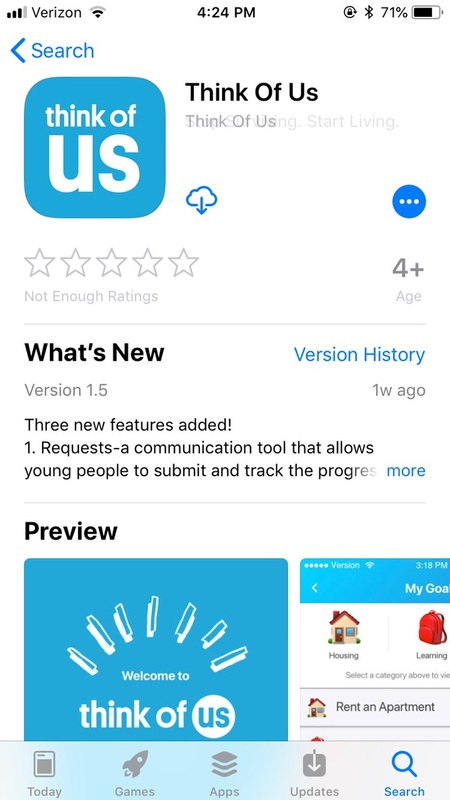 The application is designed for two groups of users (Supportive Adults and Youth) and is intended to compliment the web version of the product. Below are sample screens (broken down by feature) for both existing and planned features. The Goals feature is a planning tool that engages young people and their supporters in a structured planning process. 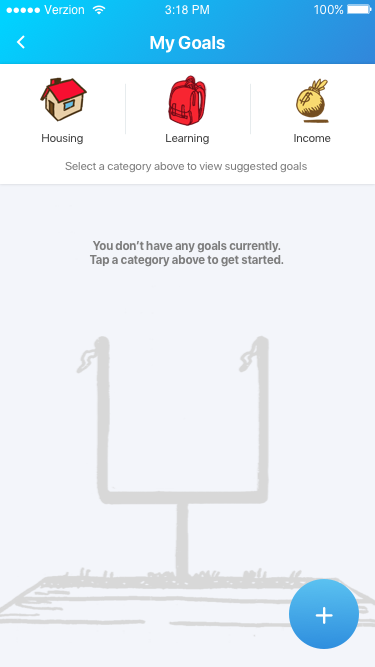 You can use it to select suggested goals, create new goals, add actions steps, and set target dates. Goals is a great place for youth and supporters to collaborate and work on accountability. Supporters is a network building tool that encourages a young person to grow a team of caring adults around them. Only young people can invite supporters to the Platform. However, you can help your youth identify other supportive adults they could invite. Supporters help youth get and stay connected, wherever they go. Requests is a communication tool that allows youth to submit and track the progress of requests to supporters. Supporters can respond to youth requests, but cannot create requests. You can use Requests to easily manage and track all requests from a youth in a single place, as well as provide youth status updates. Requests is a great place to practice accountability skills with the youth you support. Digital Locker is a digital storage solution for young people to securely store their sensitive documents and paper work incase of emergencies. Documents are stored via Box Storage systems in HIPPA compliant servers and can be accessed via the young persons account whenever needed. Eventual capabilities include sharing capabilities with supporters and temporary, password protected, links. Stories & Advice is a learning tool that allows youth and supporters to watch videos and read articles relevant to young adults with foster care experience. You can use Stories & Advice to find practical and youth-friendly advice on a wide range of topics, such as writing a cover letter, taking ADHD medication, and going through a break-up. Stories & Advice is a place the young people you serve can find encouragement and validation for their own unique experiences. Hotline has been developed as a tool for young people to get more immediate help than, possibly, what their support network can offer. This is a list of resources that they youth can ‘pin’ and are populated with contact information as well as a brief description of the services provided. Future functionality includes adding personal hotlines or additional items not entered by the Think of Us team. Tyson is a virtual assistant that greets a young person each time they get on the Platform. Supporters do not interact with Tyson. Tyson can suggest activities for a young person to complete, such as creating a new goal or making a new request. Tyson helps personalize the Platform to each individual youth. Native iOS and Android applications as well as the stand-alone web platform was a priority to our development team. The production of the mobile version of the platform was one of the last steps in the launch of the product. The design team was then responsible for all assets used when pitching to the respective App Stores.